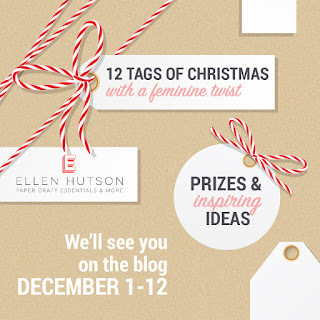 Today I am pairing up with Michele Ferguson to celebrate the Ellen Hutson's 12 Tags of Christmas Celebration. 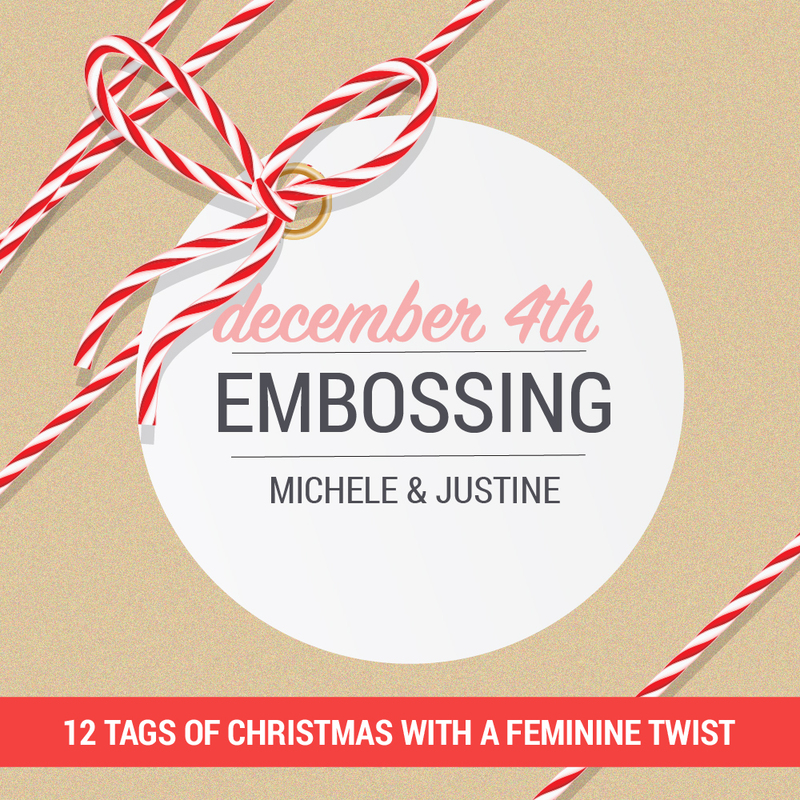 Michele and I were challenged to incorporate heat embossing, non-traditional colours and Pretty Pink Posh to create a tag or two. 1. For the first ornament or tag (you could really use it either way), I began by stamping the Caroling Critters stamp in Tuxedo Black Ink using my Misti. I didn't take my stamp out of the Misti just yet. 2. I coloured the stamp using various Copic markers. 3. 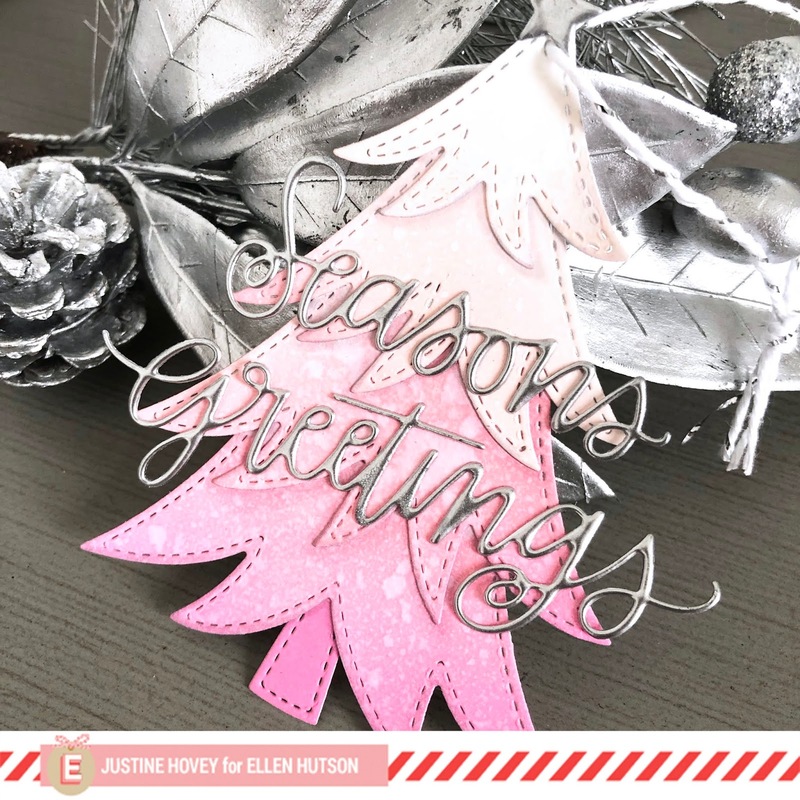 I put the cardstock back into my Misti, and stamped the image again in Versamark ink and poured clear Icicle embossing powder overtop to make it shiny and melted it with my heat tool. 4. After wards, I took another sheet of cardstock and ink blended Worn lipstick, Tattered Rose and Spun sugar to achieve an ombre look. 5. I then strategically placed the Joy Ornament Shaker die overtop of the blending and die cut so it included some white. 6. I die cut the top of the ornament using silver mirror cardstock and adhered it all together and trimmed away the access of the cardstock with the image on it. For the next ornament. I did the same ombré look on a piece of cardstock and die cut the various layers of the Christmas tree using the Layered Tree dies. I then cut the Season's Greetings and embossed it three times using Silver Sterling embossing powder. Ellen Hutson will be giving away twelve $25 gift certificates and one $150 gift certificate to the shop as a part of this fun event. Be sure to check out all the details here. So very beautiful, Justine! Your carolers look like they're right in tune!LOve that tree - hope Santa is extra generous this year - wink, wink! lovely tags, Justine - the tree is my favorite - love it! I love the OMBRE pink! What a great set of tags! A duo of delight, Justine! Your carolers are charming; the tree, lovely! Pink and silver...swoon! silver with pink in ombre, how sweet is that! Love your tags--for as cute as the one is, the other is very elegant. The pi k and silver in both tags really blend well together! Have a blessed day. Fab pretty palette on this festive tag. Sweet tags, and so pretty in pink! 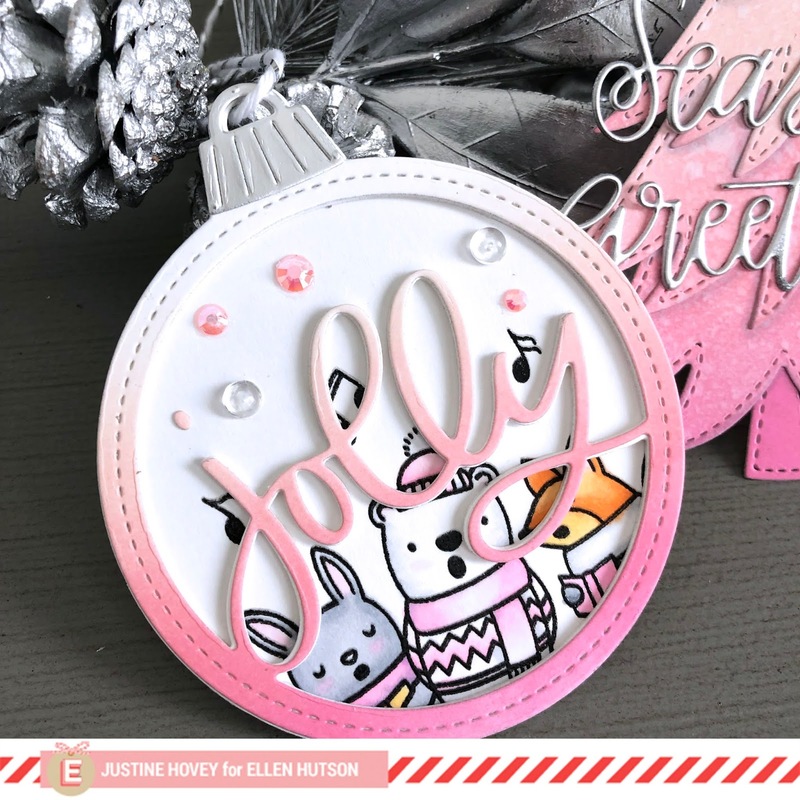 Love that cute tree shape and the sweet critters on your ornament tag! I love these tags!! Very clever to keep the stamps in your Misti so you can use versa mark after coloring to put on the shimmer. I will have to try that! Very pretty tags, love the pink! Great job! Fantastic tags! 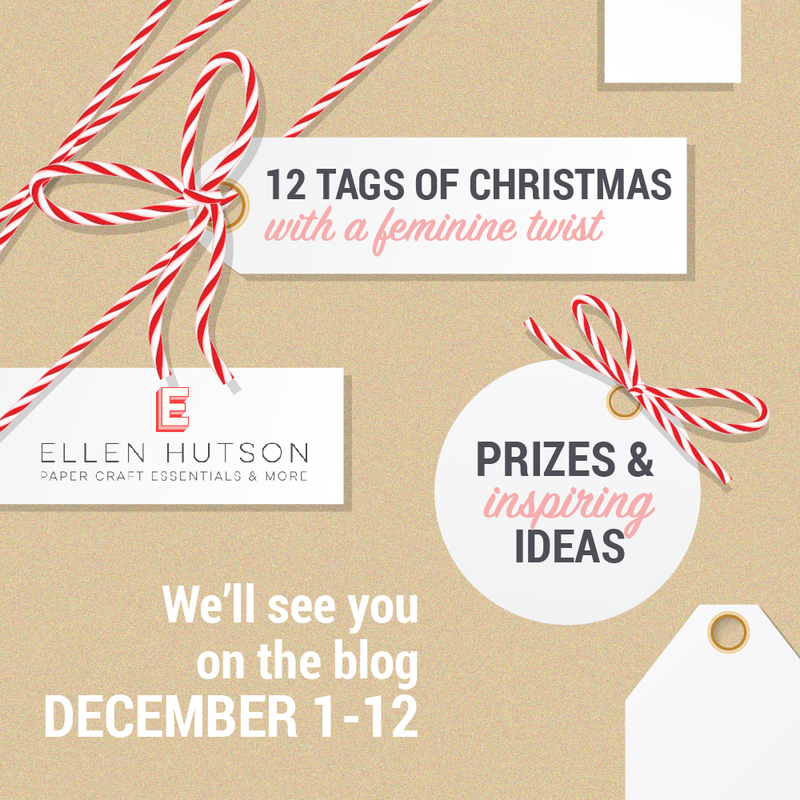 I especially like the silver and pink combo of the lovely tree tag, which is a combo I wouldn't have thought to use. It's gorgeous! I love the pink tree, so fun for the holidays! Thanks for sharing how you created these wonderful tags/ornaments. I really thought the seasons greetings was wire words or soft alphas that you can buy, not embossed die cut sentiment! They are both lovely, but that layered tree tag is my fave! I love Pretty Pink Posh products and you nailed it today with the three "F's" - Festive, Fun, and Feminine (not to mention Pink/Silver), I love them both. These are lovely. I am pretty sure I've found my inspiration for my own ornament challenge. shaker tag. The tree is gorgeous. I absolutely love your word die cut which you heat embossed three times with silver embossing powder. It looks fantastic! I want to try that! :) Pretty, pretty tags...especially the colors! Happy holidays! I love everything about your tags!!! Such fun and delightful tags!! Your shaker tag is adorable and the tree is gorgeous. The shaker tag was the perfect inspiration for something I want to make for a dear friend of mine. Thank you for sharing it with us. I love the beautiful ombre looks you have on both tags! That silver die cut sentiment on the tree is absolutely gorgeous in that sterling silver. Thanks for the inspiration. These tags are so pretty! Love the fun pink colors and that tree die is on my wish list. I love both your tags! That silver embossing is beautiful! Love that bright pink for the holidays. Love the non tradition colors used! Absolutely love the pastel Christmas tree ornament! I love both your tags, and the pink colors!! Both look amazing! Justine I am in love with that pink tree tag!!! It is so creative and the vibrancy is just beautiful! This card or these card tags both made me squeal! I am not a pink person but this is so fresh and fun! What a great idea to put the critters in the background and to add the pink hues to both tags! Spectacular!!! These are so cute and pretty! I don't know why I never use pink at Christmas time. Love these. these are gorgeous! i especially like the circle tag with the cute critters!